Gerry Roach wears his fine, dishwater-blond hair cropped short in front, a fringe of bangs framing deep-set blue eyes. At 6’ 2” and 195 pounds, he’s a bearish man built to endure alpine hardship. If it weren’t for his goofy smile, worn-out T-shirt and unlikely ponytail, the man would be intimidating. As it is, Roach is a gentle giant. Few 56-year-olds can boast a 45-year climbing career, especially those who’ve made high-altitude peaks their specialty. Gerry Roach, arguably the first to climb all Seven Summits, is one of them. 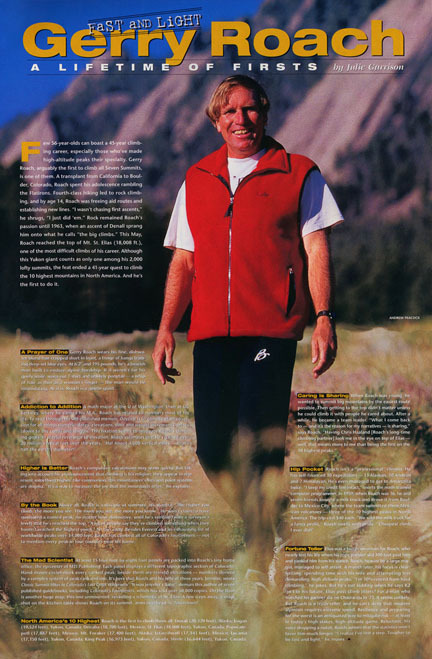 A transplant from California to Boulder, Colorado, Roach spent his adolescence rambling the Flatirons. Fourth-class hiking led to rock climbing, and by age 14, Roach was freeing aid routes and establishing new lines. “I wasn’t chasing first ascents,” he shrugs, “I just did ’em.” Rock remained Roach’s passion until 1963, when an ascent of Denali sprang him onto what he calls “the big climbs.” This May, Roach reached the top of Mt. St. Elias (18,008 ft.), one of the most difficult climbs of his career. Although this Yukon giant counts as only one among his 2,000 lofty summits, the feat ended a 41-year quest to climb the 10 highest mountains in North America. And he’s the first to do it. Gerry Roach wears his fine, dishwater-blond hair cropped short in front, a fringe of bangs framing deep-set blue eyes. At 6’ 2” and 195 pounds, he’s a bearish man built to endure alpine hardship. If it weren’t for his goofy smile, worn-out T-shirt and unlikely ponytail – a whip of hair as thin as a woman’s finger – the man would be intimidating. As it is, Roach is a gentle giant. Roach’s compulsive calculations may seem quirky. But taking into account his pronouncement that climbing is his religion, they appear to represent something higher. Like communion, this mountaineer’s lists and point systems are dogma. “It’s a way to measure the joy that the mountains offer,” he explains. Above all, Roach is a disciple of summits. His mantra: “The higher you climb, the more you see. The more you see, the more you know.” He won’t claim to have summited a peak, no matter how diminutive, until he’s verified (with a surveyor’s level) that he’s reached the top. “A lot of people say they’ve climbed something when they haven’t reached the highest point,” he says sadly. Besides Everest and an exhausting list of worldwide peaks over 14,000 feet, Roach has climbed all of Colorado’s fourteeners – not to mention every peak in four counties near his home. At least 15 four-foot-by-eight-foot panels are packed into Roach’s tiny home office, the epicenter of Summit Sight. Each panel displays a different topographic section of Colorado. Hand-drawn circles mark every ranked peak; beside them are revised elevations – numbers derived by a complex system of peak rank and rise. It’s here that Roach and his wife of three years, Jennifer, wrote Classic Summit Hikes in Colorado’s Lost Creek Wilderness. “It was Jennifer’s baby,” demurs this author of seven published guidebooks, including Colorado’s Fourteeners, which has sold over 50,000 copies. On the floor is another huge map, this one unmounted, revealing a schematic of St. Elias. A few steps away, a snap-shot on the kitchen table shows Roach on its summit, arms overhead – Touchdown! Roach is the first to climb them all: Denali (20,320 feet), Alaska; Logan (19,524 feet), Yukon, Canada; Orizaba (18,700 feet), Mexico; St. Elias (18,008 feet), Alaska and Yukon, Canada; Popocatepetl (17,887 feet), Mexico; Mt. Foraker (17,400 feet), Alaska; Iztaccihuatl (17,343 feet), Mexico; Lucania (17,150 feet), Yukon, Canada; King Peak (16,973 feet), Yukon, Canada; Steele (16,644 feet), Yukon, Canada. Elias was a tough mountain for Roach, who nearly lost his life when his rope partner slid 100 feet past him and yanked him from his stance. Roach, heavier by a large margin, managed to self arrest. A month later, his focus is clear: writing, spending time with his wife and attempting less demanding, high altitude peaks. “I’m 10% retired from hard climbing,” he jokes. But he’s not kidding when he says K2 isn’t in his future. Elias post-climb jitters? For a man who watched his partner die on Chacraraju in ’71, it seems unlikely. But Roach is a truth-teller, and he can’t deny that modern alpinism requires extreme speed. Resilience and preparing for the worst is an antiquated way to mitigate risk – at least in today’s high-stakes, high-altitude game. Reluctant, his voice dropping a notch, Roach admits that the statistics won’t favor him much longer. “I realize I’ve lost a step. Tougher to be fast and light,” he muses.